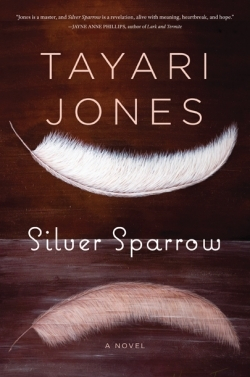 “My father, James Witherspoon, is a bigamist.” Thus begins Tayari Jones’s latest novel, Silver Sparrow, a story that blossoms and winds its way around this one, life-making fact. Set in 1980’s Atlanta, the book peels open James’s life, or rather, his two lives—the one with his legitimate wife and daughter, Laverne and Chaurisse Witherspoon, and the one with his secret family, Gwendolyn and Dana Yarboro. Told from the points of view of both daughters, what unfolds in these pages has nothing to do with convention and everything to do with love, how it pushes and prods you to startling ends, and compels you to make choices you would never imagine. Silver Sparrow is Jones’s third novel, and she writes with the adeptness and grace of one who is both gifted and highly skilled at her craft. Her narrators’ voices ring with authenticity, their openness frank and unflinching. The story holds not a wink of sentimentality or woe-is-me-ism, and it’s what allows Jones to more than pull off this tale of deception, secrets, and four women scorned. Dana states matter-of-factly that Laverne found James first and says, “My mother has always respected the other woman’s squatter’s rights.” Dana and Gwendolyn are not to be pitied, and yet, one can’t help but marvel at how they cope with such closeted ways. Chaurisses’s existence is in direct contrast to Dana’s—she’s grown up believing that hers is the average life of a just-about-average girl. But as her part of the story progresses, she realizes how little she knows about her past and present, as well as that of her parents’, and how much she doesn’t even understand. She says, “It was like my mother was a newspaper that everyone could read except for me.” Her mounting awareness unfolds with grace, Jones’s touch feather-soft as she propels characters and reader alike toward the moment of discovery, when all the secret threads will be cut and unraveled. What lengths will one go to for family, for obligation? This novel calls that into question, and asks how someone can break free of the circumstances she has no part in forming. It makes one stop and look hard at friends and lovers, and particularly at oneself—what can be let go, or never given up? And what happens when what was once truth gets shattered? As Chaurisse says, “It’s funny how you think you can know a person,” but in the aftermath of catastrophe, love goes on—troublesome and complicated, and yet, alarmingly simple. Love that is unshakeable, even if one might wish it could be different.